Having never read the book, I can’t give you a comparison–I apologize. However, I was encapsulated by this film. 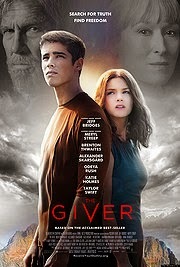 Beautifully filmed, The Giver is not as familiar as we think. It’s based on a novel written in 1993–twelve years before Blake Snyder’s beat sheet formula. And although, from what I heard, it’s not exactly like the novel, there’s only so much of the plot that you can leave out in order to make it formulaic. The themes are brilliant and thought-provoking. It shows us two aspects of “ancient” humanity–the good and the bad. But while the audience will want this new society to change back, they won’t do it without considering what bad we have done as well. Very deep stuff. But with that said, there are a couple of things that could have been done differently. For instance, it could have been a little longer. The setup is rushed. Instead of showing more insight into the world in which they live in, it got to the action too quickly. They should have explained things more and get us to really understand it as though we were in that universe too. The rushing also deprived us of developing the characters as much as it could have. The betrayals and heartbreaks would feel even more hurtful. I mean, the pacing did move quickly to keep it interesting, but I wouldn’t have complained if they wanted to immerse us more into the film universe. The acting was so-so. Bridges and Streep were great. And so is Brenton Thwaites (Jonas). However, Odeya Rush’s character, Fiona, felt uninspired at times. Her actions pre-wisdom didn’t seem convincing enough and therefore wasn’t as much of a dramatic shift in character when she stopped taking her vaccines. But the film didn’t exploit the love story as much as it could have. And although it seemed like they wanted to at times, it found a happy medium. Overall, it succeeded at getting its message across and stuck to it the whole time without trying to include any subplots. The concept and themes are undoubtedly sincere and meaningful. And the script didn’t pose any real disconcerting questions to the audience either. All it left me wondering about was what else was out there beyond the border. The thing that separates it from the political and social statements that similar films have made is that it taps into a concept that is not only relevant now, but always will be. And then it leaves us hanging. It doesn’t show us how the rest of the community responds to this “gift” of knowledge. Which leaves us to wonder if this will all be for the better or if humanity will fall back into its own ways.